Mr. Hansen’s broad practice encompasses business law of all sorts, including purchase and sales of businesses, as well as business formation; residential and commercial real estate and development; estate planning; zoning and land use; and gaming law. Mr. Hansen began in private practice at Herschbach, Tracy, Johnson, Bertani and Wilson in 1976. He was instrumental in the founding of Empress Casino. In 1994, he became Vice-President and Chief Legal Counsel for Empress Entertainment, Inc., Empress Casino Joliet Corporation, and Empress Casino Hammond Corporation. He returned to private practice in 2001, opening Michael W. Hansen P.C., through which he served the Joliet community until joining KG&G. 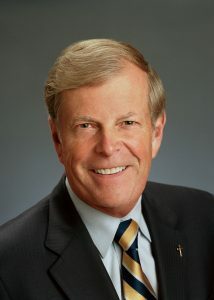 Over his career, Mr. Hansen has held positions with several committees in the Illinois State Bar Association, and has been involved with numerous local charitable and civic organizations, including the Will County Center for Economic Development, Troy Township Precinct, and boards for Lewis University, the University of St. Francis, and Joliet Catholic Academy, among many others. 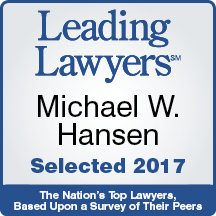 Mr. Hansen has earned the respect of his peers in the legal community for his many accomplishments, receiving the highest legal rating of AV Preeminent® from Martindale-Hubbell, as well as being named as a Leading Lawyer by the Leading Lawyer network. Mr. Hansen served as the Ombudsman for the Illiana Expressway in 2014. He and his wife Elizabeth were recipients of the 2008 De La Salle Award from Lewis University. He also received the 2010 Christus Award from the Upper Room Crisis Hotline and the Distinguished Citizen Award and the NESA Outstanding Eagle Scout Award from the Boy Scout Rainbow Council in 2018. Mr. Hansen was also a member of the Illinois Gaming Board in 2018. Mr. Hansen and his wife live in Joliet and are the proud parents of four children, the oldest of which sadly passed away in 2015. They are the doting grandparents of three grandsons.